Another year of hiking adventures beckons. All you need is a blank sheet of paper and a pen to begin weaving the magic of a hiking adventure. The destination, length, and purpose of the trip is up to you. If you haven’t reached for paper and pen yet, what are you waiting for? Maybe it’s the big scary word ADVENTURE. So borrow my definition: Any time you wander away from your front door with a light heart and a chance to let the world show you what’s real - that's an adventure. Then you need to follow this guy’s blog: Alastair Humphreys, the king of microadventures. He’s issued a "Winter Solstice Microadventure" challenge – check it out at alastairhumphreys.com. This month I have a special treat for you: a chance to see the beauty of being “off the leash” outdoors through the eyes of a youngster with exceptional parents. Bonus: some wise words from her mother about slackpacking and vagabonding. Seems as if the hiking theme going into the New Year is to just get out there and have yourself some adventures, regardless of age and location! Who can argue with that? Elna Kruger is a 14 year old blogger with a keen eye and ability to capture the essence of outdoor time on her blog titled A Family’s Travel Adventures. share her words and photos with you. I also wanted to share her mother Willemien's insights into what family slackpacking and vagabonding is like. I think you'll enjoy a vicarious adventure to South Africa. Give a Girl You Know This Book!! Tell the truth: When was the last time you picked up a book and saw girls rock climbing, fly fishing, caving, mushing and other fantastic adventures outdoors? So when Randy Zeidberg shared her new book with me (there’s a page devoted to backpacking), I couldn’t keep it to myself. I just had to share it with you! I learned to backpack when I was Elna Kruger’s age, under the wise tutelage of Girl Scout leaders. These amazing women took the time and made the effort to give me basic safety and navigation skills on Isle Royale in Lake Superior. Because of my admiration for them (ok, and for the sport of hiking), I went on to be a Girl Scout and Cub Scout leader for my kids, to “pay it forward”, as they say. When I saw this book, I was reminded again of how precious our young girls are. There are so many distractions in today’s world, whispering to them that playing in the dirt or climbing rocks isn’t as much fun as (insert social distraction here, such as texting a friend). 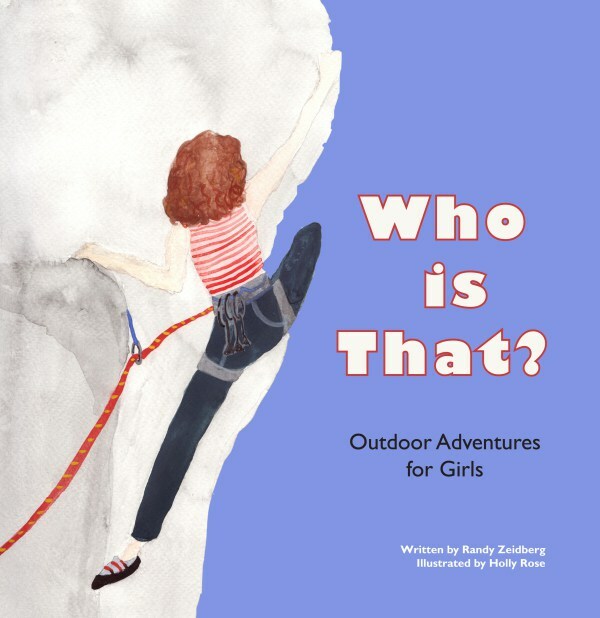 This book cuts to the heart of being a young female in the outdoors: feeling a sense of achievement and oneness with your body. Where else do girls get this opportunity, outside of sports teams? The girls in this book are shown solo-ing, which makes the book even more interesting to me. There’s no one helping, coaching, assisting or guiding these girls, leaving the reader to imagine what it would be like to be that girl in the rock climbing harness. So give this book a look here. It would make a mighty fine gift for your favorite girl. And just for the record, there’s no affiliate relationship between Randy and myself, just a shared belief in girl empowerment. My wish for you in the new year is one of adventure, in whatever way you define it. Don't let anything stand between yourself and the outdoors. Put some "outdoor me time" on your agenda. In fact, start as soon as you finish reading this. See how easily it begins? <>As always, feel free to contact me with questions, suggestions, or comments. I truly enjoy reading my email. And if you'd like to be interviewed to share your experiences, I'm more than willing to ask questions!